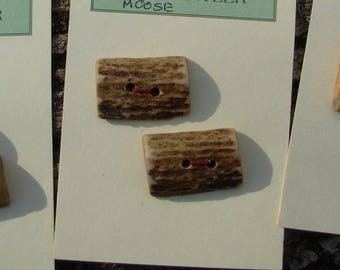 Announcement New Moose antler Austrian Style buttons available in 2 sizes! New Moose antler Austrian Style buttons available in 2 sizes! I love these! They're beautiful. SPECIAL NOTE: ITEMS ORDERED BETWEEN JUNE 3 AND JUNE 11, 2013 WILL BE PROCESSED JUNE 12TH DUE TO A SALES TRIP. Lost or damaged items will be refunded in full or replaced. If you wish to make an exchange please contact the shop owner to make arrangements prior to returning the item. You will be charged for all shipping costs for exchanges. Payment may be made by credit card, PayPal, Etsy gift card, check or money order. Items paid for by Check or money order will be shipped upon receipt of payment. Need 7 buttons? Not a problem, custom orders are welcome! I would be happy to set up a reserved lot to meet your needs - please contact me! I can also supply wholesale quantities of buttons and some other products. Contact me for details.